You know you want them to discuss the book. You know you want every student to participate. You know you don't want awkward silences, you want awesome engagement. Recently I ran a summer reading discussion for twenty-one students, most of whom did not yet know each other and had never been with me in class. I needed to think about how to engage them and keep things interesting for forty-five minutes without yet having any groundwork. 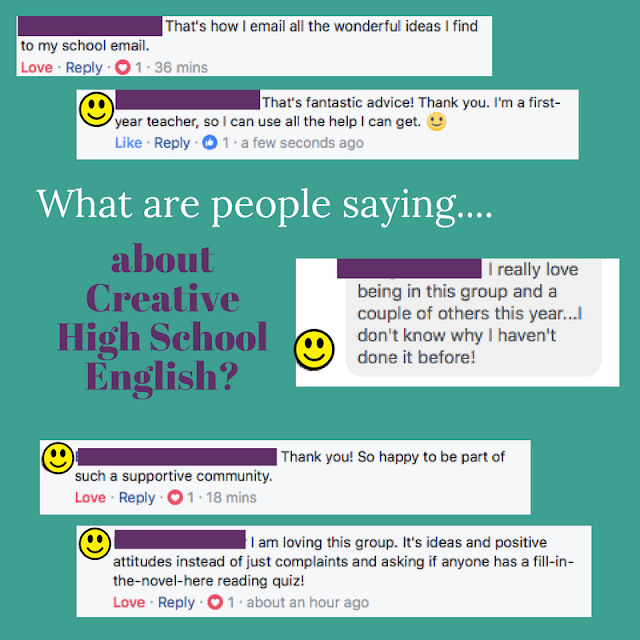 I didn't even know most of them, and I certainly hadn't had any big talks with them about group dynamics or discussion methods. At the end of the session, the students left smiling. Throughout the time there was the kind of happy buzz in the room that gives me that teacherly glow I love. I felt like I was able to wheel and deal a decade of experience in education to keep the kids interested from the first minute to the last, so I thought I'd share the strategies I used as a case study. If you're new to teaching, or you'd like a few discussion ideas, this post is for you. A bit of set-up. We were discussing S.E. Hinton's The Outsiders, the book I sponsored in our school summer reading program. Before the students arrived, I put a handout on every desk and scattered colored pencils between every two handouts. The handouts were one of my favorite discussion warm-up exercises, in which students write down everything they can think of that will help represent what is going on inside a character's mind. 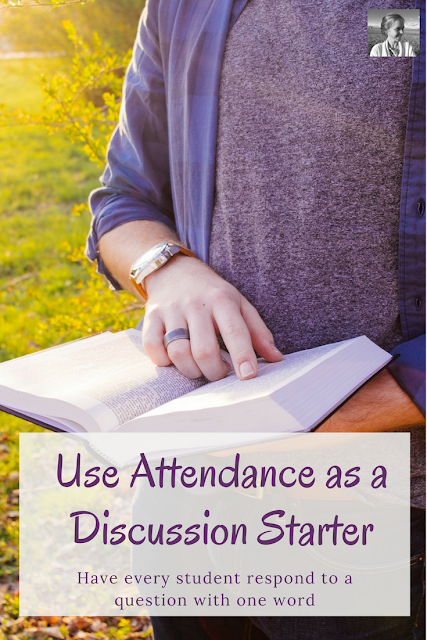 Letting students do a short warm-up activity that reminds them of the reading before a discussion is so helpful. Often they've been thinking of a million other things since they read the material, and they need a refresher. 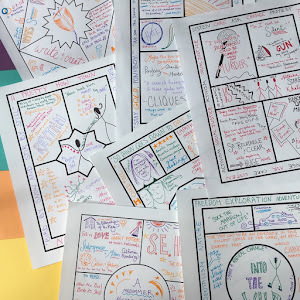 Which reminds me that I've put together a packet of fifteen discussion warm-ups for you as a free download if you just don't have time to create one more handout for class. These warm-ups can be used for any text. I also put up a quotation by Ralph Waldo Emerson on the board: "Consistency is the hobgoblin of little minds." As students walked in, I asked them to begin filling out the open mind warm-up for the character Ponyboy with a partner. Soon I was surrounded by the sounds of scratching colored pencils. I walked around a bit and answered questions, loaning my book to a pair of students who forgot theirs. After five or so minutes I asked students to stop so I could take attendance and we could begin. Instead of having them say here, I asked students to respond to their names by saying their favorite character. Everyone paid attention as students called out the names of their chosen characters - lots of Ponyboy and Sodapop, a few Johnnys and one Dally. The attendance question led to some argument and discussion over favorite characters. We talked for a few minutes about why they had chosen their favorites, then came back to the warm-up about Ponyboy. I asked students to share ideas from their open mind warm-up, and I jotted them in chalk on the board as they called out their thoughts. We painted a picture of Ponyboy on the board, including key quotations, traits, goals, issues. They were very enthusiastic in their conversation, I think because they identify so much with the book. Their enthusiasm led me to ask a question and ask for a show of hands. This is one of my favorite quick total participation techniques. If you have students raise their hands to show an opinion, then you can call on anyone to support that opinion. "Raise your hand," I said. "If you liked this book." All but one raised a hand. One raised his hand halfway, and one kept it down. I called on several students to say why they liked it, then asked the halfway raiser why he felt mixed about it. Finally we heard from the student who didn't like it. Everyone listened attentively, not knowing if I was going to ask them next, and seemingly genuinely interested in each other's takes. Soon I redirected them towards the quotation I had put on the board. I read it aloud, and said it was one of my favorite quotations, and that it seemed to fit uniquely with a core theme of Hinton's book. "Why?" I asked. "Stand up, find a new partner, and talk to that new partner about why." There was a bustle as everyone left their seats to find someone new to talk to. I wandered around for a couple of minutes listening in, and then asked partnerships to turn to other partnerships and share what they had discussed. Again everyone was talking, again there was no real way to hide out and avoid being part of the discussion. As soon as a couple of groups appeared to have exhausted the topic, I asked everyone to come back together. "What does Emerson mean with this quotation?" I asked. "How does it relate to The Outsiders?" 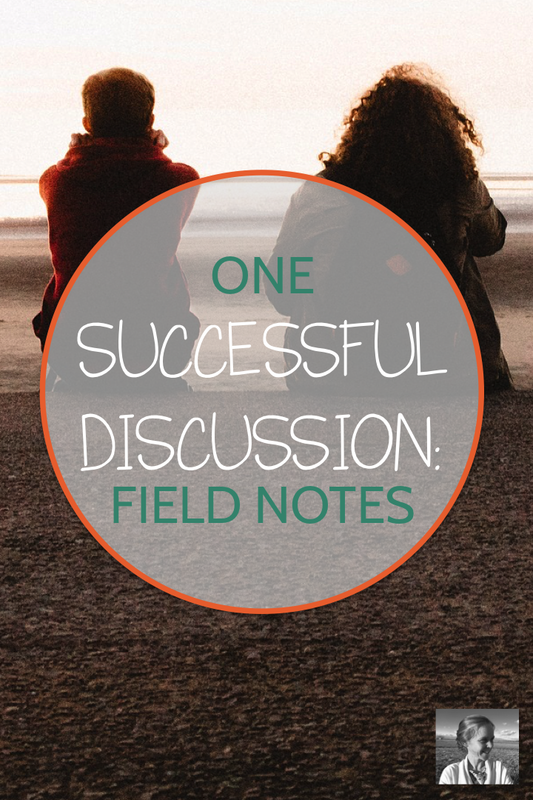 After already having discussed the question with a partner and another partnership, everyone had something to say. I tried to bring in everyone I could to the discussion, especially directing towards people who were speaking out for the first or second time. As in any group, several students wanted to talk almost all the time, so I called on them now and then but helped them to wait while others spoke as well. (This is an issue I usually tackle by using the Harkness discussion method, but that was not possible in this situation). Soon enough we ran out of time. I thanked the students for their enthusiasm and collected their open mind handouts because I was curious to see what they had written and drawn. By and large, they left with smiles on their faces. These basic strategies can apply to any discussion, and they make your life so much easier. 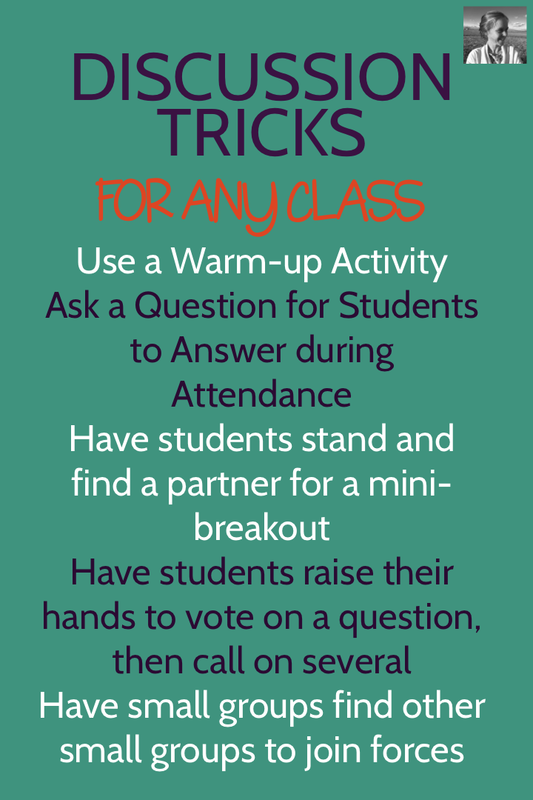 When students come in distracted by other things, use a warm-up activity and a related attendance question. Whenever you hit an awkward silence, have students find a partner and talk. When you need to shake things up, ask a direct question and ask for a show of hands. These easy strategies are ones you can turn to at a moment's notice. 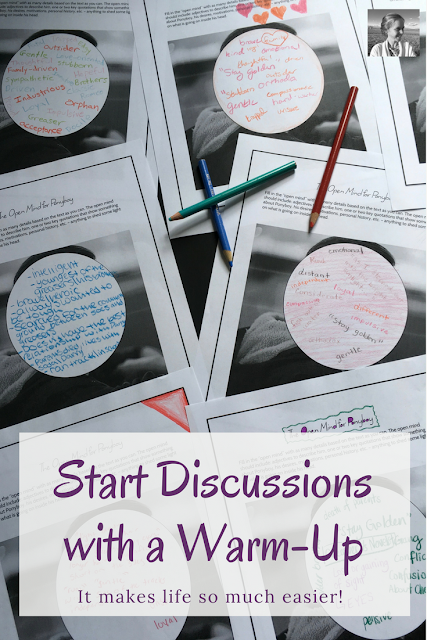 Are you always looking for creative ideas for your classroom? Join the conversation in our rapidly growing Facebook group, Creative High School English!